By Mark Ferguson for CoinWeek – MFRareCoins.com ……. It’s common knowledge that CAC verified coins have been selling for premium prices since the inception of CAC on November 1, 2007. But until now, collectors, investors and dealers haven’t had a resource to find out how much those price premiums amount to by series and grade for PCGS and NGC graded coins that have the CAC “green bean” sticker of approval versus those without CAC stickers. I’ve just concluded a comprehensive market study that does just that. It reveals the amounts of price premiums CAC verified coins are selling for, by series and grade, as compared to non-stickered PCGS and NGC coins. The concept for this exhaustive market study , which analyzes recent auction sales of more than 5,500 type coins – from one cent coins through $20 gold coins, originated with the author and CoinWeek. The study was performed independently of CAC, but was commissioned by and conducted in cooperation with CoinWeek and CAC – Certified Acceptance Corporation respectively. This analysis is not a random sample. It’s a complete market study that compares auction sales prices of like-kind CAC-stickered coins versus non-stickered NGC and PCGS graded coins. Major coin auctions between January 1, 2010 and June 30, 2012 have been thoroughly examined by series and grade. For very common coins, like Morgan and Peace Dollars, Walking Liberty Half Dollars, and $20 Saint-Gaudens gold coins, where there was enough data to analyze, auction prices realized were reviewed for a more recent timeline – between January 1, 2011 and June 30, 2012. Importantly, auction price trends indicate that the coin market, for the coins and grades analyzed in this market study, has generally been steady and stable since the beginning of 2010 for the types and grades of coins studied. It’s the market segment for scarcer and rarer issues for which prices have been appreciating during that time. After the financial meltdown of 2008, most coin buyers took a cautious wait-and-see attitude during the following year, 2009, finally starting to open their wallets during the fall and winter of that year. Therefore, coins sold during 2009 were not included in this market study. This study focuses on common high grade, Mint State “Type Coins” – those issues which are the most common coin issues of a specific design type in a particular denomination. Proof strike issues were not included in this market study. Additionally, sales of coins from series with an element of scarcity are too difficult to track in quantity, for obvious reasons, so there are many series that could not be examined. Examples of such coins are “early” coins, like Flowing Hair and Bust material, and early gold coinage – all minted prior to about the 1840 time period. Additionally, CAC does not review or sticker “modern” coinage, with the recent exception of Eisenhower Dollars; so modern coinage is also not a part of this market study. Because of the amount of historical sales data available, and the capability of its search functions, Heritage Auctions was used as the source for all of the data analyzed. However, major auctions conducted by other companies were considered and looked at, but at this time, no other auction company provides such a comprehensive range of coins sold for which the sales data is so easily accessible by computer searches on the company’s web site – an important consideration for this market study. I also want to repeat…this market study is not a random sample. It analyzes all sales of the coin issues and grades studied during the time periods reviewed. In other words, all sales of CAC-stickered examples and all sales of NGC and PCGS non-stickered examples of like-kind coins were tallied and analyzed for each coin type and grade examined in this market study. The full CAC market study report provides detailed lists of the specific dates and issues of each coin type and grade analyzed. All auction prices examined in this study include buyers’ fees. Among the general conclusions found in this market study is that, in all series and all grades, CAC-stickered coins are selling for higher prices, on average, than those same-grade PCGS and NGC encapsulated coins that are not CAC-approved. No exceptions were found for any series or grade studied. A dominant trend observed throughout the series and grades is that the higher the grade, the higher the CAC price premium realized over non-stickered PCGS and NGC coins. There were a few exceptions found to this trend, however, for reasons that are speculative, but most likely due to a lack of larger sales data for those particular coin types and grades analyzed. Because CAC-approved coins appeal to buyers of high-grades, those rare coins grading Mint State 64 and higher are generally the grade range of coins submitted to CAC for its endorsement. This is borne out by statistics observed on CAC’s Population Report, found at www.CACcoin.com. However, this is not always the case, and for very rare coins, or coins of the “early” years, such as those U.S. coins struck between the 1792 and 1835 to 1840 period, for example, lower grade coins are frequently submitted. But because of the popularity and availability of data for CAC-stickered coins grading MS 64 and higher, this is the grade range primarily focused on in this market study. In reviewing the results of the complete CAC price comparison market study you’ll see some surprising results. Price premiums for CAC-stickered PCGS and NGC encapsulated coins versus non-stickered NGC and PCGS graded coins ranged from single digit percentiles to a staggering 92.87%! You can find out the exact price premiums CAC-stickered type coins have been selling for at auction, by series and grade, as compared to like-kind, non-stickered PCGS and NGC encapsulated coins, in the complete CAC market study report. “CAC” stands for Certified Acceptance Corporation. It’s an independent numismatic coin authentication service, which is not connected or affiliated with any other numismatic coin encapsulating and/or grading service, and is owned by some of the top dealers and collectors in the country. CAC began operations on November 1, 2007, and was founded by numismatist John Albanese, who was also involved in the start-ups of PCGS and NGC during the mid-1980s. CAC was created out of concern that market prices for solid-for-the-grade and premium-quality coins were being held down by the sales prices of below average quality coins for their grades, including coins that just barely make the grade. CAC’s ultimate mission is to recognize and liberate solid-for-the-grade and premium-quality rare coins from such price restraints. 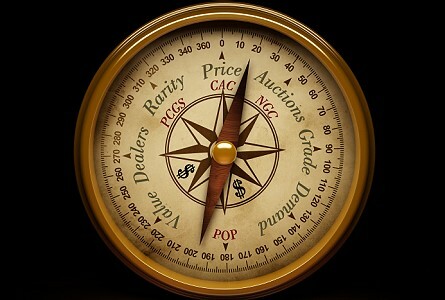 CAC uses an analogy to describe its verification process by considering levels within a coin’s grade. This analogy equates these levels to “A,” “B,” “C” and “D” quality coins in which CAC verifies and stickers only the “A” and “B” quality coins, which are considered to be solid to above average quality for their grades. Grading considerations taken into account by CAC are such qualities as the attractiveness of a coin’s luster and its eye-appeal, originality of surfaces, lack of outstanding blemishes, strong strikes, and attractiveness of toning. Coins that have unsightly abrasions, “grungy” toning, overly soft strikes, distracting spots, streaks, or other outstanding blemishes, for example, are not stickered by CAC. 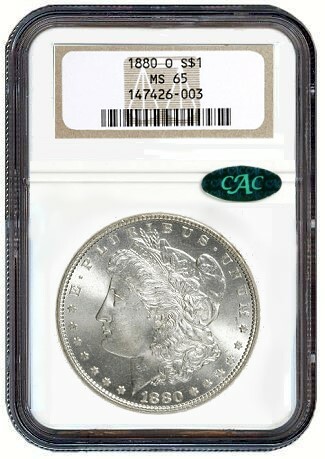 However, CAC does not necessarily consider coins that it doesn’t sticker to be over-graded. CAC stickers solid-for-the-grade and premium-quality coins only. Founder John Albanese remarked, “We’re not going to please collectors who want their coins to look like costume jewelry.” In other words, CAC will not sticker coins that have been overly dipped, or even lightly cleaned, to make them look shiny and flashy. Vintage coins with original, un-tampered with surfaces, all exhibit some degree of surface toning, even if it’s just a hint, that came from contact with their storage containers, whether those were paper bank rolls, cloth mint bags, coin envelopes, or old coin albums, for example. To the best of its ability, CAC wants the rare coins it endorses with its green stickers of approval to be unquestionably solidly-graded to premium-quality examples, and the company backs its seal of approval with “sight-unseen” market bid prices for CAC-stickered coins through CoinPlex, its dealer trading network. Importantly, for consistency in this market study, coins that were described as having proof-like fields, cameo devices, over-dates, or similar kinds of attributes, were excluded from analysis. However, sales prices of specific coins that may have been attractively toned and frequently sell for higher than average prices, especially for Morgan silver dollars for example, were used in the data because it would be a subjective judgment call to toss them out. It is believed that such toned examples were evenly dispersed between the results found for CAC-stickered examples and NGC and PCGS non-stickered examples. However, a few obvious outliers, which have sold for overly high prices as compared to typical price range trends for a specific series and grade, were tossed out. A great example of this is found in another popular series – $20 Saint-Gaudens gold coins, in which the sales prices of MS 67, CAC-stickered examples, ranged from $12,650 to $17,250. One common-date CAC-stickered outlier, which sold for a whopping $54,625, was tossed out of the mix so it wouldn’t skew the results. In comparing price averages of CAC-stickered coins to non-stickered NGC and PCGS encapsulated coins, the total prices of all sales of the non-stickered coins as a group, for each coin type and grade analyzed, were tallied, then averaged. In other words, the average prices of non-stickered coins are not “averages of the averages” of coins graded by each separate service – PCGS and NGC. And in fairness to both PCGS and NGC in this market study, one grading service was not favored over the other, if prices for coins graded by either service dominated those of the other for a particular coin type and grade studied. There were examples from both services that sold for much higher prices than the averages of those of the other service. Another factor taken into consideration is the matter of “Plus” graded coins by NGC and PCGS and NGC “Star” designated coins. Because CAC evaluates coins based just on the merits of each coin’s numerical grade, not factoring in those other designations used by PCGS and NGC, this market study followed the same standard as CAC, and those designations were not considered. 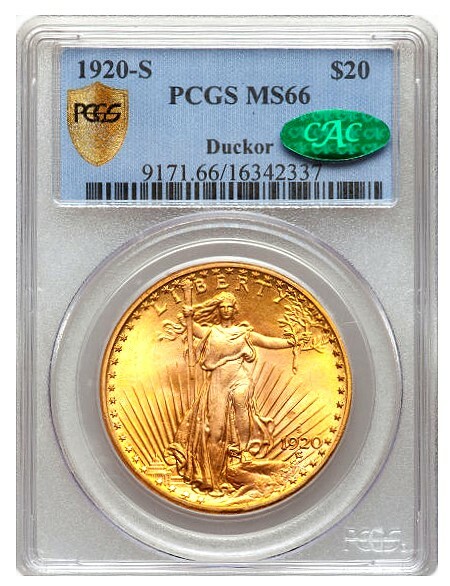 However, in special cases, CAC affixes “Gold” colored stickers to some PCGS or NGC encapsulated coins that exceed CAC’s standards. In fairness, sales prices for those coins with “Gold” stickers were tossed out of the analysis. When I began this market study I didn’t know what I would find as I went through each series. But after having been a professional coin dealer since I was a teenager, a former professional coin grader for PCGS, and the Market Analyst for Coin Values magazine between 2002 and 2009, I had some common sense expectations, as most of my professional numismatist friends from around the country would also have. However, the statistics revealed some remarkable conclusions that not everyone could envision. Many of us remember the coin market days during the 1960s and 70s, which could be compared to the “Wild West,” so to speak, when coins were bought and sold “raw,” without the backup of third-party grading opinions. During those days, “Let the buyer beware” was the law of the land. But in this day and age, there is no question that since the mid-1980s, PCGS and NGC have given consumers, and even coin dealers, enormous confidence in buying and owning rare coins, especially as market prices have continued to appreciate over the years. And by recognizing solid-for-the-grade and premium-quality coins that are without question, CAC has contributed even more to that consumer confidence. The benefits of the CAC concept have also been recognized by PCGS and NGC when both services followed suit by adding their “Plus” grade designations to select coins. But marketplace popularity has proven that advanced rare coin buyers want the additional third-party endorsement of the “green bean” CAC sticker of approval on the encapsulated PCGS and NGC graded coins they buy. A quick look at advertisements and auction catalogs show that rare coins stickered by the CAC brand are given added attention, and buyers regularly pay higher prices for coins that have been given the CAC endorsement. Mark Ferguson has been dealing in high-end rare coins and precious metals since 1969. He has graded coins professionally for PCGS and was the Market Analyst for Coin World’s Coin Values magazine between 2002 and 2009. He has written feature articles and regular columns for Coin World, Coin Values magazine, The Coin Dealer Newsletter, Numismatic News, The Numismatist, ANA Journal, Coin News – a British publication, and currently writes a weekly column for CoinWeek. He is a recognized authority in appraising rare coins and a recognized expert on the 1804 silver dollar, which is known as “The King of American Coins.” Mark can be reached at Mark Ferguson Rare Coins, LLC (www.MFRareCoins.com). Through clever marketing by auction companies and prominent media coverage of all major auction sales, many sellers of rare coins have been “conditioned” to believe that auctions are the only venues available to sell their rare coins. Major auction companies do a great job of promoting their organizations and their auction sales; and the media has done a great job of covering auction events – before and after each sale. After all, the media has a real need to create news with which to inform and entertain their readers, and major auctions are much easier to cover than digging up interesting, newsworthy private transactions that often go unnoticed. While major auction companies do a very good job promoting major collections and consignments, they aren’t the only effective means of selling your rare coins to realize fair market prices. Actually, after buyers’ fees and consignment fees are sliced off the top of the sales prices of coins sold at auction, consignors often end up with less money than they could get by establishing fair market values, often with the help of a competent dealer in the business, and selling them privately through the same dealer, for a much smaller commission. Let’s face it, buyers at auction know they’ll have to pay the buyers’ fee, now typically 17.5% at the major auction houses, and they reduce their bids accordingly. Add this to the fee consignors also pay and it all adds up to a much reduced total dollar amount taken home by consignors. Of course it’s difficult to attract the attention auction companies are able to garner by promoting their sales, but does it really make that much difference if a seller ends up with more money by selling them into the market privately? When you know what your coins are worth, by your own analysis, or with the help of a competent dealer or appraiser, you can retain more control over the outcome of the sales of your coins, rather than throwing them to the winds of chance in an auction. There’s often a reason many of the record-setting rarities have been sold privately, rather than through auctions. A few years ago, the finest 1913 Liberty nickel, one of just five that exist, failed to get any bids at all at a major auction and was reportedly sold several months later for $5,000,000 in a private sale. During June, 2012, a 1907 Ultra High Relief $20 Saint Gaudens gold coin sold for $2,760,000 at a major auction, which was considered a bargain price, bringing much less than many people believed it would sell for. In fact, PCGS ran a contest to guess the price. And actually, the very same coin sold for $2,990,000 back in 2005. But how do more common coins fare at auction? Obviously, they often sell for very strong prices. But, consignors are taking a chance between the time they place the consignment and when the auction takes place. The economy or market can change during that time. Witness the shock the country was in after the September 11th tragedy occurred, or during and after the financial meltdown of 2008. Sure, these events also affect the private coin market, but one has more control in the private market and can often act more quickly. Auctions are also subject to who’s bidding on certain coins, or who’s not. Additionally consignors are often competing against each other. Some consigned coins are often competing against one, two or sometimes more like-kind coins listed right alongside their own. Additionally, keep in mind that dealers are the biggest buyers at auction. Sometimes they’re representing and bidding for clients, earning commissions as agents, but more often than not, dealers buy at auction for inventory. So why not work with a dealer to sell your coins privately. Dealers who get around the country and are experienced in the market usually know who the best buyers are for the types of coins you’re selling. Sometimes these are collector/investors, and at other times they’re dealers who have customers who want to buy just the kinds of coins you have for sale, and consequently they’ll often pay favorable premiums to purchase those wanted coins. Of course commissions are negotiable. 10% is often a fair price for a dealer to charge to sell coins by consignment. However, for very expensive coins, say coins selling for $25,000, $100,000 or $250,000, for example, many dealers are willing to work on much lower commissions. 5%, or even 2% or 3%, are within reason as fair commissions for selling major rare coins. But, on the other hand, for extremely common and inexpensive coins, or coins that take more than an average amount of work and expense to market and sell, a higher commission of 15% or even 20% could be considered fair. Remember there are insurance fees, travel expenses, possibly advertising expenses, etc. for a dealer to cover. For upper-end coins, dealers are known to create brochures, DVDs, exhibits, etc. to creatively market the coins. Press releases can be distributed and articles written to make news about interesting rare coins, collections, hoards, etc. An expertly-researched and well-written information article about your rare coins and collection could be placed on CoinWeek.com, for example, to publicize the coins you have for sale, if they’re worthy of such an endeavor. Consider the Redfield hoard of more than 400,000 uncirculated silver dollars that was marketed during the 1970s. The clever promotion and marketing of this huge group of better date and common issue coins actually stimulated the silver dollar market, and prices skyrocketed, rather than collapsed, as a result of clever marketing. Shipwreck finds have similarly been given great coverage by the press, as have important collections sold privately. Some coins are even sold by a sealed bid process, and of course they don’t have to be sold if minimum prices are not met. So if you have rare coins for sale you might consider discussing what you have for sale with a competent and connected coin dealer. There may be additional opportunities that you hadn’t thought of to realize strong market prices for your coins. For example, an experienced dealer can help you get your coins re-graded to your advantage, or point out the advantages you may find in having your coins examined and stickered by CAC. The key is to establish fair market values for your coins before marketing them privately. However, be aware that this is often not as easy as looking coin values up in price guides or auction archives. There may be hidden opportunities to realize strong prices for your coins that a competent and trustworthy dealer can help you recognize and achieve. So check out your options with a seasoned pro! You could end up with much more money in your pocket than you originally expected for your coins. For additional information, click here to read my article entitled, Seven Steps to Selling Your Rare Coins For the Most Money in the Private Market. Numismatics has been a life-long endeavor for Mark Ferguson. He began collecting coins at age six and began dealing in coins as a teenager in 1969. He specializes in high-end U.S. coins, but is well-rounded in all phases of U.S. numismatics – throughout all series and grade ranges. As the Market Analyst for Coin World’s Coin Values magazine between 2002 and 2009, establishing all its values for all series and all grades, and a PCGS coin grader between 1987 and 1990, Mark possesses unique qualifications in the U.S. coin market – especially when combined with his long-term coin dealing experience. Mark has been continuously building his numismatic library since he first began collecting coins. He regularly researches U.S. coins and has written extensively in the numismatic field for major publications including the American Numismatic Association Journal, CAC, Coin Dealer Newsletter, CDN Monthly Supplement, Coin News (Britain), CoinWeek, Coin World, Coin Values magazine, Numismatic News, and The Numismatist. He has been a long-term weekly columnist for four of these major publications. Mark is considered an expert on the 1804 silver dollar – which is known as “The King of American Coins.” He can be reached at [email protected] or 920-233-6777. In his well known book with the familiar title “All I Really Needed to Know I Learned in Kindergarten,” Robert Fulghum presents the argument that it is often the first and most basic lessons that are most meaningful for handling the problems and complexities of life later on. Although numismatics probably isn’t on the same level of importance as dealing with the deepest philosophical and emotional issues of human existence, I’ve found the same to be true of the way I’ve gone about making sense of coins and the science behind them. Early copper (a category including U.S. Colonial Coppers, Large Cents, and Half Cents) might appear at first glance to be a very basic and maybe boring segment of U.S. coinage. These were the lowliest of circulating money at the time, and as such, not much effort was put into the design of the coins being particularly pleasing aesthetically and a very utilitarian approach was implemented for their design as well as production. As far as Half Cents and Large Cents go, they were all produced at just one mint,Philadelphia, up through being discontinued in 1857. So, there are no mint mark varieties or other mint peculiarities within the series to interest collectors. Despite all its seemingly mundane characteristics (or perhaps because of them), early copper became one of the first truly specialized fields of U.S. numismatics soon after coin collecting became a popular and mainstream hobby around 1860. Many collectors focused only on the early U.S. copper coinage, especially Large Cents, and it quickly became one of the most well-researched and avidly collected areas of the hobby. This wealth of information and research was accelerated by the formation of the Early American Coppers (“EAC”) coin club in the 1960’s and now EAC is recognized as one of the largest and most active specialized coin clubs. This article will highlight 3 areas central to the study and collecting of early U.S. copper coins that have significance in almost any other part of numismatics. I am not saying that early copper is the only place to start to gain a well-rounded and informed grasp of these concepts. That is certainly not the case, as by now almost all series of U.S. coins are very thoroughly researched and offer much to their respective specialists as far numismatic skills go. For me, though, I’ve found these principals to be especially well-developed and easy to learn from in the realm of those big copper coins. Most series of U.S. coins follow the following framework for how they are researched and collected: Within any given “type” there are specific “issues” which are coins with a unique date and mintmark combination. Beyond this, there are specific coins within these dates and mintmarks that might have some kind of diagnostic oddities and these are known as “varieties.” These varieties may or may not be included in what is considered a “complete” set of any given series. Let’s take Buffalo Nickels for example. The most basic way of collecting Buffalo Nickels, other than having a single type coin, would be by date and mintmark. Then there are a few major varieties, coins within these dates and mintmarks with peculiar die characteristics that are often times included in a date and mintmark set. Namely, the 1916 Doubled Die, the 1918/7-D, the 1937-D 3 Legs, and the 1938-D/S. Three of these four varieties carry hefty price tags, but it is not known for sure, and would be difficult to figure out, whether or not these die combinations are any rarer than any other die pairs within those given dates that do not have such distinctive or noticeable characteristics. Within the early copper series, however, there is not such a mystery. For Half Cents and Large Cents as well as the State Coppers among other pre-Federal Coppers, every die variety is sought out and given equal status as far as categorizing goes, and therefore every coin is a “variety.” It isn’t just the more distinguishable dies that are paid attention to, but every difference from die to die is scrutinized and collected separately. The most well-known example of this kind of organization is the “Sheldon set” of early date Large Cents, 1793-1814. Even though there are only 22 different dates within this short set, there are over 300 unique die varieties that are all collected separately, each with their own number. So, for Sheldon collectors it is just as meaningful to say you have an “S-266” as you have an 1804 Large Cent. This is just one of the 300+ unique varieties in the series. Again, this sort of organization by die variety is not unique to early copper, as all series of earlyU.S. silver and gold and now, the Seated Liberty series are being collected this way. But, I feel die varieties are all the more noticeable in early copper and easy to pick up, so it’s a good place to start. So what are the benefits of thinking about coins in this way – every one as a distinct die variety? Not only is it interesting to think about the relative rarity of different die pairs within lesser researched series and to scrutinize coins for minute differences within dates and mintmarks. Being familiar with die varieties and die characteristics has some more practical applications as well. The one I will mention here as it is an important topic nowadays in the hobby – being able to recognize counterfeits. One well-known numismatist was fond of saying, “Recognizing die varieties is like recognizing friends’ faces.” That means, even without nitpicking the tiny diagnostics on a coin to figure out which set of dies it’s from, you can recognize and remember the overall “look” of the coin and have a good idea which variety it might be. The same thing holds true as the best way to determine a real coin from a counterfeit, even as the fakes are getting better and better. It takes a long time looking at lots of coins and familiarizing yourself with die characteristics, but after a good amount of time spent examining real examples of any given coin, seeing a counterfeit will immediately look “off” and from there, examining the diagnostics closer will confirm it. One of the further specialized areas of study that happened pretty early on in the field of early copper was the categorizing of die states. That is, within the course of any die pair being used to turn out coins, one can recognize the deterioration of those dies by certain characteristics on the coin’s surfaces. These characteristics are familiar to many and include die polishing lines, die cracks, die breaks (cuds), die rust, flowlines, and loss of detail due to die refinishing. Die states are avidly collected within many early copper series and rare states of certain varieties, even if the difference seems trivial, can carry large premiums for interested collectors. Probably the most well-developed research in die states is that done by Bob Grellman for late date Large Cents, 1840-1857. So much work has been done there that within one line in the Red Book, let’s say an 1849 Large Cent, you can collect 30 different die varieties and within each die variety as many as half a dozen distinct die states! While that kind of specialization may not be for everyone, there have been several coins from other series that have become famous and valuable even though they are merely distinct die states of a certain pair of otherwise uninteresting dies. Probably the best example of this will take us back to Buffalo Nickels where the 1937-D 3 Legs variety (as well as the less popular 1936-D 3 ½ Legs) is merely a late die state example of a particular die pair that had the reverse overly polished resulting in the loss of one of the buffalo’s legs. Another example of a famous die state is the 1922 “no D” Lincoln Cent where the obverse die was used so excessively that the peripheries of the die became weak, flowlined, and certain details, including the mintmark, became indistinct. While these definitely are remarkable die states and deserve the attention they receive, it is interesting to think of them merely as late die state examples of probably very common dies. Not only this, but understanding especially these two varieties as die states will again aid the collector in spotting counterfeits or altered examples. That is, since they are both extremely late die states where the dies had deteriorated to a great extent, they will not only show the missing leg or missing mintmark, they will also show other signs of deterioration such as the flowlines and roughness on the obverse and reverse of the 3 Leg and flowlines and specific weak detail on the 22 no D. Looking for these things and understanding the stage of the dies will make authentication much easier and more intuitive. If EAC, the club, is known for anything in the broader coin community it is for its’ unique, very strict grading style that is as heralded as it is controversial and oft-debated. “EAC Grading” is essentially a method of net grading, that is, starting with a grade for the sharpness of a coin or the amount of detail remaining and then subtracting from that grade a certain number of points for any problems or condition issues the surfaces show. These problems can include corrosion, scratches, rim damage, cleaning, repairing, etc. or any combination thereof. The difficulty lies in determining how many points to subtract for different problems as certain condition issues will have a different level of severity from grader to grader based solely on personal taste. Though for as many disagreements and variations in grades that there are, the one consistency is that the “EAC” grade of any particular coin will almost always be lower than “commercial” or “mainstream” grade of the same coin – not just slightly lower, but sometimes to the extent of a 20 or 30 point difference. I point this out not to examine the pros and cons of the EAC grading system, but to show that the reason the EAC net grades almost always come out lower than the accepted commercial grades is that EAC grading takes surface quality and eye appeal very seriously. It is this distinguishing between a coin that is low end, average, or very high end and premium quality for any given grade that I want to glean from the EAC system and apply to the numismatic market in general. In some ways, the rare coin market has always taken the quality of a coin within a given grade into account when determining desirability and value. Sophisticated buyers will always not only consider the grade a dealer or grading company has assigned to the coin, but will make their own assessment and also consider their own personal preferences as for the appearance, toning, originality, etc. of any coin. The general coin market has only recently begun to try to categorize and standardize this distinction between coins that are low end and high end for the grade. The introduction of CAC to the hobby has been shown to be a very effective way to make this distinction as the prices asked and realized for coins with CAC approval very often best those without. The major grading companies followed suit with the introduction of “Plus” grading and the market responded to this as well. These changes have occurred fairly recently, over just about the past 5 years, but the research and cataloguing of early coppers within the EAC fold has made attempts at standardizing and distinguishing quality to an even greater extent for several decades now. Some might say that the plethora of descriptors used in 3rd party coin grading – including Stars, Plus grades, Green stickers, Gold Stickers, etc. – are a bit much, but those specializing in early copper have been using an even more sophisticated and sometimes complicated system for a while now. CQR (Copper Quotes by Robinson) is the price guide created by EAC member and long time collector and researcher Jack Robinson. It covers Half Cents and Large Cents, is the standard price guide and an indispensable resource for those collecting these series by die variety. It not only lists exhaustive condition census information and prices for all die varieties in all applicable grades, it lists prices for as many as 5 (!) different levels of quality within every grade. There are coins on the low end with serious surface problems (termed “scudzy”), 3 levels of mid-range coins with moderate to light amounts of surface issues (termed “average -” “average” and “average+”) and coins with virtually no imperfections (termed “choice”). While this seems like a lot of categories, it makes perfect sense to try to format an accurate price guide this way to take into account the price differences attached to coins of varying qualities. Consider that for coins in any series, you will rarely see the same coin in the same “grade” realize the same price time after time. There will be differences, sometimes significant differences, from coin to coin based on the quality, originality, and eye appeal of each specific piece. The field of early copper has emphasized these differences for quite some time and the coin market in general and third party grading will continue to do the same, probably to even greater extent in the future. There are certainly several other important ideas from the world of Large Cents and Half Cents that have import for numismatics broadly, but these three are probably the more significant. While it was the early copper field specifically that got me started on connecting these concepts to other areas of the hobby, the moral of the story is to find the area or series of coins that appeals to you, read and learn all you can about it, and see where it takes you. Having that specialized knowledge will better allow you to make connections, discern trends, and find patterns in other areas of numismatics and lead to a more stimulating and enjoyable hobby overall. Kevin Vinton, numismatist at Sam Sloat Coins Inc. since 2009, specializes in Colonial and early Federal copper coinage. He is a member of ANA, EAC, C4, JRCS, and other organizations. Established in 1961, Sam Sloat Coins Inc. has long been recognized as one of New England’s oldest, largest and most reliable coin shops. Located in beautiful Westport, Connecticut for over 50 years, Sam Sloat Coins is a true brick and click store. We maintain a full service, secure internet web site, an eBay presence with over 15,000 successful auction sales and a 1,200 square foot showroom filled with a most diverse and eclectic inventory. You will find our representatives at most major coin shows and conventions. We are members of the Appraiser’s Association of America, Westport Chamber of Commerce, American Numismatic Association, American Numismatic Society, Bermanian Guild of Numismatists and all major numismatic associations. Located at 606 Post Road East in Westport, Connecticut we invite you to visit when in our area. Our store hours are 9:00 to 5:00 Monday through Friday, Saturday 10:00 to 3:00. In this or any hobby, which would you rather have: Extensive wealth or extensive knowledge? At first many of us may jump at the extensive wealth thinking that money will lead to knowledge. But there is an old saying that a fool and his money are soon departed! This statement holds very true in numismatics. We have read horror stories about brokerage firms tricking the elderly by selling coins for multiple thousands of dollars, in many cases their entire retirement funds, and providing those worth substantially less. Thankfully this is less commonplace today, but even today many collectors entering the hobby may have deep pockets, but not the knowledge on how to put the money to good use. Knowledge is power, it is as simple as that. If you are able to learn how to grade, and spot problems in coins, you will do well. I know that every day I look at coins, I learn more and more about them. Now some of you may still not be convinCed and will say that with extensive money, you can hire an expert who will guide you in the right direction. In some cases this may work, but how do you know the expert you have hired is not swindling you and giving you pennies on the dollar in return? Sadly in numismatics, there are many dishonest people who will try to take advantage of those who are uneducated. I have seen examples of this at shows where prices seem to fluctuate greatly when someone is naive versus knowledgeable. So for those who are entering this great hobby, and to those who have been at it for a while, take some time to read! There are many books out there that have invaluable information that will benefit you in the long run and help you make proper decisions. In collecting we will all make mistakes. The hope is that the mistakes are small, and do not cause significant financial loss. Speak to others in the hobby and join message boards. Ask as many questions as you need to in order to learn! If you feel that you know a trustworthy person in the hobby, learn as much from them as possible. Many shows offer courses in grading and how to detect doctored coins. Take full advantage of these! But most of all, remember to have fun! Ankur has been collecting since 1991, starting with just reading comic books and eventually moving on to vintage comics, comic art, coins and other Americana. He began collecting coins in 2006 after seeing the first 1 oz. gold Buffalo. Today he has a vast collection of early US type, many of which are stickered by CAC. Ankur describes himself as a pure collector at heart and is always adding to his collection. In addition, Ankur recently founded and currently moderates the Unofficial CAC Collectors Forum. Posted by CAC | Filed Under CAC In The News | Comments Off on Extensive Knowledge or Wealth? This philosophy has followed me through all the segments of my life, but never so much as during my numismatic ventures. The story of how I came into numismatics was published in the Ledger several years ago, but in short, I inherited various coins from an aunt when I was in my 30’s. At that time I didn’t have any experience or knowledge about coins, so I had no idea what the coins were worth. Also, I had a full-time career as a litigation paralegal and a family so my plate was full and I didn’t really have time to learn about all the different coin series. So I decided to focus on just one type of coin and since I’ve always had an interest in Native American history, I chose the Indian cent. I began reading books, watching grading videos, searching websites, attending coins shows, studying all grades and quality of coins, and asking a lot of questions of dealers at shows who didn’t mind helping me. I tried to learn everything I could about Indian cents (and later Lincoln and Early American Copper cents) so I would have a comprehensive understanding of these coins before I felt comfortable buying and/or selling them. But the one thing that kept coming back to me throughout my quest was that every time I thought I had a good understanding of a certain aspect of coins, I would learn something else that would remind me once again how little I actually knew about numismatics! As a dealer and collector of Indian, Lincoln and EAC cents, I feel pretty comfortable with my knowledge in these series. But at almost every show I attend I get a question or two that stumps me – and the title quote of this essay once again pops into my head reminding me that I still have so much to learn, even in the coins I specialize in. Further, I often attend shows with the famed Indian cent expert and author, Rick Snow, who is not only a good friend, but someone I consider as a mentor to me. The more time I spend with Rick and his encyclopedic knowledge of Indian cents, once again, the more I realize how much I have to learn. He has spent many years researching and studying Indian cents in depth and I could only hope to someday have even one-tenth of the knowledge he has on this beloved series. And if you could choose the best place to gain more numismatic knowledge, it would have to be the ANA Summer Seminar program. Personally, I still have a lot to learn and I believe the ANA program is the best place to gain knowledge in all aspects of numismatics. The quality of their programs, the experience and knowledge of their teachers, their tireless volunteer helpers, and the camaraderie that occurs among all of these groups is what especially draws me to want to participate in the ANA summer program – not to mention the fact that I simply don’t want to miss out on another great numismatic adventure! So never stop seeking knowledge – it is life-long but wondrous adventure! This Southern California mother of two has gone from a litigation paralegal to a preeminent authority on U.S. one cent pieces, specializing in Flying Eagle, Indian, Lincoln, and Early American Copper Cents. Looking back on starting out as a brand new coin enthusiast to having amassed quite an empire of nice small cents, a little inheritance was the beginning of something very special and rewarding for her. And because Charmy is a woman who specializes in only cents, she eventually earned the dubious title of “The Penny Lady.” While she finds being female is somewhat of an oddity among coin dealers, she has never been made to feel like an outcast or that she didn’t belong in this business. On the contrary, most every coin dealer with whom Charmy has come into contact with has been more than kind and helpful, with many now even referring their Indian cent customers. To provide high quality coins at a fair price. To make sure my customers are completely satisfied with their purchases.